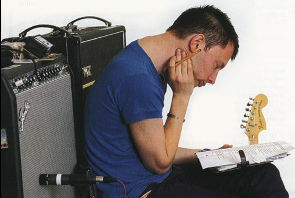 Thom pictured here with his amps. Thom's preffered amp is a Fender Twin Reverb. 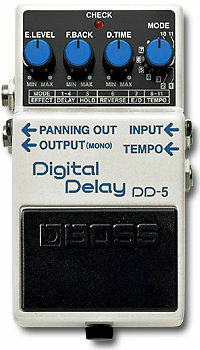 He plugs into it by way of a ProCo Turbo Rat distortion pedal and a Boss digital delay. He also uses a Marshall JMO-1 preamp, various Fender Twin's and VOX AC30s. When asked about strings, he replies, "I use them." Thom did "Fitter Happier" on a Macintosh computer using the built-in SimpleText voice generator using the "Fred" voice setting.